More of an XL, don't you think? 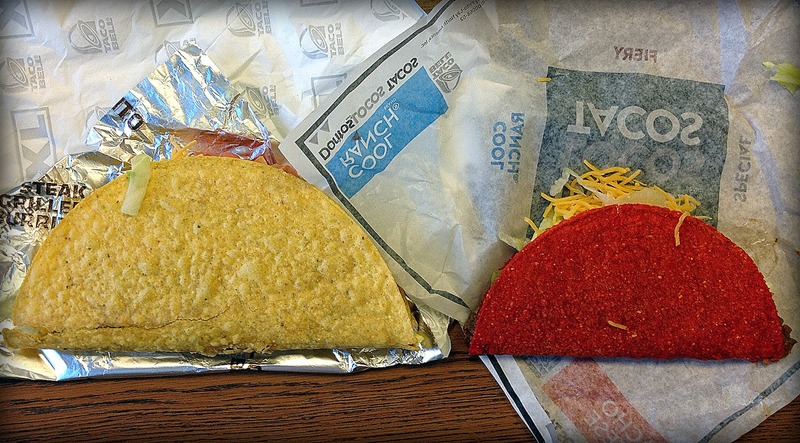 Today's trip to Taco Bell is brought to you by double-rationalization. Since I ran for a humblebraggingly long 45 minutes and I felt like writing (slow workday), I decided to treat myself, which was an XXL mistake. In the interest of your time, I'll keep this fairly short and to the point. Don't waste your money on the XXL Steak Taco. The slightly oversized shell falls apart at first crunch, and it's a bland sonofabitch (probably because I've spent the last year eating shells that are either made of assorted Doritos flavors or waffles). The steak wasn't actually too bad, though it was more brisket than steak, and there was nowhere near enough of it to warrant 'XXL' status. The avocado ranch sauce was more sour creamy than anything (not a bad thing), but the whole experience felt like I was eating a boring old taco supreme. Good thing I could chase it with a Fiery Doritos Locos taco. In retrospect, I probably should have just gotten two of those, which I could have done for the same price as one stupid slightly bigger taco. In summary, we should just let Nate Robinson have them all, because we can't handle the XXL Steak Taco. Buen provecho.